Flow measuring of liquids is needed in many industries and in certain applications accurate flow measurement is so important that it can make the difference between profit and loss. Flow is classified into open channel flow and closed conduit flow. Most devices measure flow indirectly and are commonly divided into those that sense or measure velocity and those that measure pressure or head. The sensors that Sigma offers are from the first category and are further subdivided in to impeller, ultrasonic and calorimetric. These versatile impeller flowmeters are availalble in 3/8", 1/2”, 3/4”, and 1" nominal pipe sizes with female NPT threads (SAE optional). They employ jewel bearings to allow for very low minimum flow rates and superior life. The flow sensor features a six bladed impeller design with a proprietary, non magnetic sensing mechanism. The forward swept impeller shape provides higher, more constant torque than four bladed impeller designs and is less prone to be fouled by water borne debris. The forward curved shape coupled with the absence of magnetic drag provides improved operation and repeatability even at lower rates. This is more important where the impeller may exposed to metallic or rust particles found in steel or iron pipes. As liquid flow turns the impeller, a low impedance 8VDC square wave signal is transmitted with a frequency proportional to the flow rate. This signal can travel up to 600m (2000') between the sensor and the display unit without the need for amplification. All the sensors are supplied with 20' of Belden type 9320 (two conductor shield) cable and can be fitted in Tees from 1/2" up to 2" diameter. The 100/200 series of Paddle Wheel Flow Sensors are adjustable depth insertion paddlewheels that come in brass or 316 stainless models to fit 3” to 48” pipe. Installation fittings are standard 1-1/2" (101/201) NPT. Fittings such as saddles and weldolets may be purchased either locally or from us. Magmeters have the same form factor as paddle wheel sensors but replace the moving paddle wheel with a magnetic induction circuit. The absence of any moving parts makes these sensors perfect for dirty environments where debris would foul a paddle wheel sensor. As long as there is a minimum conductivity of 20 µS/cm the magmeter will work. Pipe sizes 1" to 12"
SI5 series flow sensors for fluids and gases.The SI flow sensor provides a SPST relay output. 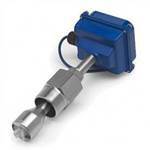 The sensor can be used in a variety of applications that require fluid or gas monitoring. The sensor’s 316 stainless steel sensor tip is inserted directly into the flow stream. The SI features a programmable microprocessor-based pushbutton set up with automatic high- and low-teach function. The SI flow transmitters provide a 4-20 mA analogue output via an industry standard Micro DC connector. The SI's sensor tip is inserted directly into the flow stream. The microprocessor-based pushbutton set up features "teach" function. A bar graph display provides visual indication of operating status. SI2 series flow sensors for sanitary applications. Sanitary flow sensors are solid state sensors with no moving parts that can break and contaminate the process, which are designed to monitor flow in food, beverage and other sanitary applications and meet 3A, FDA and EHEDG requirements. These sensors use a versatile adapter system that allows the sensor to fit multiple process connection sizes. SF series two piece flow system for remote indication & control. The SF Series flow sensor uses a sensor probe and a control monitor for remote monitoring of fluids and gases. Control monitors feature potentiometer adjustable set point with bar graph display. Two models are available: DC switching output and AC relay output. The sensor probes use a unique modular adapter system that allows various mounting options. Explosion proof SF series flow sensor with 2 piece design for remote indication and control of flow.